Race Takeaway: Perfect race weather does not equal perfect race experience. Saturday, May 2nd Rob and I ran the Lake Run Half Marathon at Lake Bloomington, IL. There are three distance options now with this race, the 4.37 Mile, 12K, and the half (which was added last year). Rob had ran the inaugural half last year and Chase and I cheered him on. This year we weren’t sure what the weather would do so we decided to have Chase stay home with a sitter and we could both run the half distance. The weather turned out to be gorgeous, around 65 degrees and sunny. It was making up for the terrible weather at the IL Half Marathon the week prior. If you come to this event, I would suggest to get there an hour early for parking reasons. Parking extends along a country road and it’s just easier if you can manage to get there early to find a spot. We waited around hanging with our friends: Jon, Brandi, Kyleigh and others. Brandi was a rock star and pushed her two year old daughter in the stroller for the half marathon – yowza! The 12K and half start first and the 4.37 mile race starts about 30 minutes later. This race has a chip start/finish, which is a nice bonus for lining up. There are no corrals, just a clump of people so the chip start mat helps you get a better reading for your personal race. I wore both my apple watch and Garmin again, but this time on the same arm (my left) so I could compare during the race if I wanted (which I didn’t end up doing). The temperature felt amazing and I felt good considering I haven’t been racing back to back weekends is ages. I knew the rolling hills would get to me since I’m not great with hills, but I was still feeling optimistic as my paces were still doing well even 6 miles in. That went away completely when the race course turned to a gravel (loose, big chunky gravel) . This out and back section of a mile (or more?) was so annoying, slippery, and draining that I just felt done afterward. My pace slowed way down and I was trying to remain hopeful that once back on the roads I would again regain some of my stride and get back on pace. That never happened because from mile 9 to the end my stomach was cramping and I felt very sick. I had over a year of terrible stomach issues while running and racing and it appeared it was back. This race is a small town deal so porta potty options are limited, water stops table set ups were small, and no medical that I noticed. This is not a half that I would recommend to a first timer or someone with known stomach issues (aka me). I slogged through the final miles refusing to stop at a porta potty that I finally saw next to a park area. I just wanted to be done and go home to rest. I don’t think I’ve felt this bad in a half, that I can recall anyways. I immediately knew I was going to have to get back on my plan of taking a probiotic pill to try and correct my stomach problems in the future. In the past I saw a doctor and that was their recommendation, which did end up helping. I had just stopped when I got pregnant and subsequently started nursing. After that I just hadn’t been running enough to realize any stomach problems, but now it was time to get back into that routine again. I crossed the finish line in 1:58:51. Rob finished in 1:52 and felt good. There were comments that the course may have been short. It can happen for newer races to potentially be long/short so hopefully if that were the case it gets addressed next year. And hopefully the course could be arranged to not include gravel. On a side note, since I didn’t have a good race I didn’t spend time looking at my apple watch on the course. It still find the ending a workout clunky and it takes a few times to tap it to get it to stop. I still don’t see this replacing my Garmin, but still trying it out to see how it does. I also need to try out other running apps with it to see how they function. 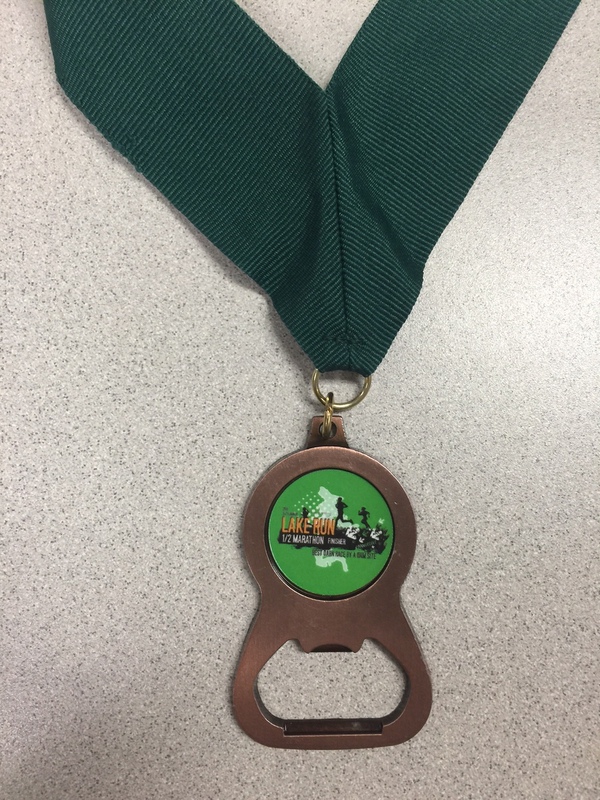 The medals were unique, a bottle opener. Next Chase is 2 Years Old!! !